Mornings are the hardest for Evan Premer, although nights aren’t much easier. His sleep, wracked with nightmares of war and violence, has no consistent pattern, so he often wakes up feeling tired and overwhelmed. But he does have a game plan for feeling better: Once he rises from bed, he hits the road, turning up the music in his Jeep on his drive to a greenhouse in the small town of Firestone, Colorado. Here he feels more relaxed, listening as water hydrates his plants. There are no cubicle walls or phones ringing or colleagues arguing. This is the office that works for him. Premer, who is now 36, served 15 years in the military, most recently as a Colorado Army National Guardsman in Iraq. In basic training, he and his fellow soldiers were taught to only show strength. “You never let the enemy see your weaknesses,” he says. “And that’s why I’m so broken today.” When Premer returned from the Middle East in 2007, he studied photography in college for a while. But the strobes and flashing lights he had to use triggered bad memories of his time in war, so he gave it up. Premer manages his post-traumatic stress disorder by growing food. About two years ago, he and his mother started a business, now called Dirtless Farm, growing microgreens, baby greens and culinary herbs for local restaurants. Premer had previously trained at Circle Fresh Farms in Denver, which is run by an ex-Marine, Buck Adams, who also founded the nonprofit Veterans to Farmers. At Circle Fresh, Premer learned about aeroponic production, a space-saving system where vegetables are grown out of vertical towers year-round, with no soil and little water. He can grow all sorts of produce, from vine plants like tomatoes, strawberries and eggplants to leafy greens and herbs. He might also help save American farming. The average U.S. farmer or rancher is 58 years old, and many of them will soon retire. Most of these farmers don’t have a succession plan for their business or land, and that lack of planning makes farmland more vulnerable to development, and small-scale family farms easier for corporations to gobble up. That’s why the U.S. Department of Agriculture (USDA) is calling for at least 100,000 new farmers in the coming years. Attracting military personnel to farming is one way the USDA hopes to develop this workforce. On November 14, at an inaugural conference in Iowa for groups assisting veterans interested in agriculture, USDA Deputy Secretary Krysta Harden named former Marine Corps Reservist Karis Gutter as the military veterans agricultural liaison, a new position created by the legislation. Gutter’s job is to connect veterans to vocational farming programs and assist them in using federal education benefits to pursue this profession. This follows the 2014 Farm Bill, which for the first time recognized veterans as a distinct class of “beginning” farmers and ranchers—those with operations under 10 years old. This allows the group to receive additional government assistance for agricultural programs. For instance, farming veterans will be charged a lower interest rate by the USDA’s Farm Service Agency on direct-operating loans for such things as livestock, fuel and building repairs. Vets on farms are good for U.S. agriculture, but perhaps more important, this provides a way for servicemen and women to assimilate back into society and find meaningful employment. There are about 22 million veterans in the States today, and many face physical and psychological barriers adjusting to civilian life after living through violent conflicts in the Middle East and elsewhere. “I like to tell veterans that they train you how to go to war but not how to come back,” says Richard Murphy, a third-generation Air Force veteran and program manager for Veterans to Farmers. Rates of homelessness and divorce are higher than normal among vets, and the unemployment rate for younger vets is much higher than for the rest of the population. An estimated 20 percent of U.S. troops wounded in post-9/11 conflicts have been affected by a traumatic brain injury. It is estimated that somewhere between 11 percent and 20 percent of veterans from recent wars currently suffer from PTSD—a condition often accompanied by depression, substance abuse and other anxiety disorders—and data show that 22 veterans of all ages die by suicide every day. It might be too early to tell whether farming can alleviate these problems. There is “no evidence that farming is, in and of itself, efficacious in treating PTSD. That does not mean that it’s not. It means that we do not know,” says Dr. Sandro Galea, a professor and chair of the department of epidemiology at the Mailman School of Public Health at Columbia University. That’s a problem modern medicine has with pretty much every PTSD treatment, though: In June, Galea chaired an expert advisory panel assembled by the Institute of Medicine that concluded government agencies weren’t doing enough to track and evaluate the effectiveness of PTSD therapies. Dr. Daniel Weiss, a psychologist at the University of California, San Francisco, says that early research suggests farming programs can be helpful to veterans over the short term but that more evidence is needed to determine the value of this nonstandard approach over the long term. “There is clear anecdotal evidence from individual veterans and their families of the importance of these programs in helping to cope and recover from the psychological injuries suffered during deployment, but this cannot substitute for systematic studies,” Weiss says. Meanwhile, personal testimonies like those from Murphy and Premer suggest that engaging veterans in agricultural work can provide a solution to the challenges vets face by providing these men and women with viable careers and a new purpose in life once they leave the military. The most prominent group supporting integrating military veterans into agriculture is the Farmer Veteran Coalition, based in Davis, California. Founder Michael O’Gorman had been working in organic farming for nearly 40 years when retirement finally crossed his mind in 2007. At the time, he was thinking a lot about veterans returning from conflicts in the Middle East. O’Gorman’s oldest daughter had worked across the street from the World Trade Center when terrorists toppled the Twin Towers on 9/11, and a couple of weeks later his youngest son enlisted in the Coast Guard. For a couple of years, O’Gorman would hop into his pickup truck and drive up and down California whenever he heard about a veteran interested in agriculture. He would try to help vets find an apprenticeship or a job. Word spread about his efforts, and in 2009 he formed his coalition. Veterans have not stopped calling him since. Many of these veterans need land and money to buy equipment and supplies. They also needed training—not only in agricultural practices but also in how to run a successful business. After all, farming is far from a sure bet. Drought, floods and pest outbreaks are just a few of the many things outside a farmer’s control that can torpedo a business. The physical labor is demanding, and the profits often low, as shown by the USDA’s most recent Census of Agriculture, in 2012. About 75 percent of the nation’s 2.1 million farms sold less than $50,000 in products that year; 57 percent had sales under $10,000. The Farmer Veteran Coalition considers these challenges as it matches members to apprenticeships and jobs, funding opportunities and business resources. But that’s no small task; the coalition’s network boasts nearly 3,500 veterans. Sara Creech, a former Air Force nurse, aims to help. She’s developing a training program in small-scale sustainable farming for veterans, scheduled to launch this spring. She hopes to attract some members of the Farmer Veteran Coalition who are looking to be placed at a working farm to learn how to start their own enterprises. Growing up in the suburbs of Kalamazoo, Michigan, Creech wasn’t exposed much to agriculture, besides occasionally catching the whiff of a nearby hog farm. That changed after her husband, Charles, an Air Force pilot, was diagnosed with colon cancer in 2010. The couple devoured documentaries on food and adopted a healthier diet. They planned to buy some farmland when Charles got better, where they would grow their own organic produce and raise chickens and turkeys outdoors on fresh pasture. But in May 2011 he died at age 32. “When he died my entire world imploded,” Creech says. One day in July 2011, she decided to run away from everything, move to the country and farm. Five months later, she bought a 43-acre foreclosed farm in North Salem, Indiana, and named it Blue Yonder Organic Farm. In 2013 Creech attended Armed to Farm, an agriculture training program for veterans organized by the University of Arkansas, the Farmer Veteran Coalition and the National Center for Appropriate Technology. While there, she met combat veteran Alicia Moore, who had lost several military friends to suicide following their deployment. Both women found the experience so affecting that they wanted to create a similar hands-on immersion program at Blue Yonder. “We talked about our dreams of farming and the power of working with the land to find healing,” Creech says. Since then, Blue Yonder’s products have received Homegrown by Heroes certification, issued by the Farmer Veteran Coalition to distinguish food grown or raised by military personnel in the marketplace. To date, about 150 farms use the logo. For veterans like Premer and Creech who have found healing in farming, their work doesn’t end when they lock the greenhouse doors or go inside for the evening. They both help their comrades-in arms. 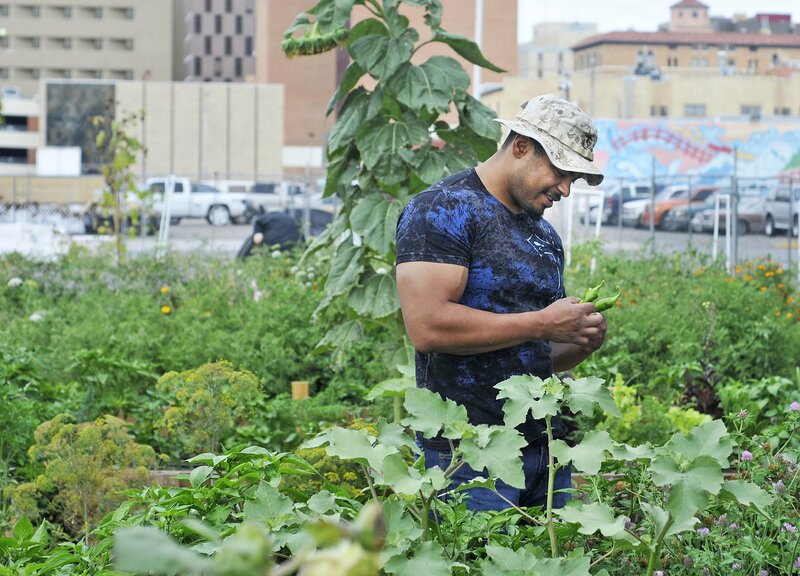 To do his part, Premer plans to invite veterans to Dirtless Farm to teach them about aeroponics while Veterans to Farmers finishes building its 10,000-square-foot national training center in downtown Denver. If farming helps bring him peace, he figures it just might do the same for someone else.